Hong Kong has a very developed and sophisticated transport network, encompassing both public and private transport. Over 90% of the daily journeys are on public transport, making it the highest rate in the world. Hong Kong possesses one of the safest, also cheapest, transportation networks amongst most of the major cities in the world. 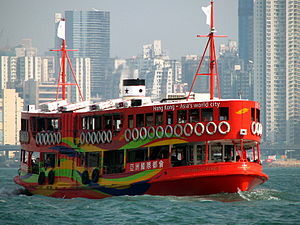 Therefore, unlike many large cities where security and crime on public transportation is always criticized and projects a negative reputation towards visitors, Hong Kong has a highly positive reputation of a safe, clean and accessible system, where travellers can always be confident of safety and economical journeys. The public transport ticketing system of Hong Kong is incredibly simple despite the transport system's vast degree of interconnectivity. Just buy an Octopus Card, beep in at the beginning of each journey and off you go! Hong Kong was one of the first cities to apply, and is currently the city with the most advanced use of smartcards as electronic payment, especially on public transport. Once in Hong Kong, the most convenient way to pay the fares while travelling around is by Octopus Card, available from any MTR station or one of the thousands of convenient stores and shops around the city. "Add value" (top-up) services are also available at any of these locations. Incidentally, the Octopus Card is widely accepted means of payment for everyday goods in convenience stores and food outlets. As can be gleaned from its full name – Mass Transit Railway is currently the metro-train services operator of Hong Kong. It provides a convenient, network-extensive, and primarily the most efficient mode of transportation for travelling across different districts of Hong Kong. Fares vary according to the travelling distance and districts, and range from approximately HK$3.50 (one stop); HK$12 (cross harbour); HK$36 (cross-border). All metro stations are accessible with franchised bus services, and some are accessible with airport buses, although Airport Express is provided by MTR system (but it has a higher fare than buses). If you are travelling by Airport Express with an associated connection to another MTR routes, a discounted fare is included on that particular connection journey. Hong Kong Station, as the terminus of Airport Express, is located in the heart of the business financial centre of the city – Central. Kowloon Station is reachable by local buses as well and is walking distance from Jordan area. In-town check-in services and feeder buses between major hotels within urban areas and Hong Kong/Kowloon Station are provided; they are complimentary for passengers who are travelling with Airport Express from/towards these two stations. A journey between Airport and Hong Kong Station takes about 24 minutes. All MTR stations are shown on the map above; convenience stores and ATMs are available at most stations. MTR also operates a series of local feeder bus routes (mostly beginning as K-prefix) in the suburbs of the New Territories including Tuen Mun – Yuen Long region and Tai Po aimed at connecting local areas to its railway network; fare discounts may be provided on travelling them with associating a light rail or mainline rail connection. Despite generally good service on MTR, MTR does not readily provide service advisories beyond the stations concerned. Instead, a volunteer-driven service called MTR Service Update provides service updates on Twitter by interacting with passengers and other volunteers. You may receive twitter updates about the service and ask for assistance on MTR Service Update as the volunteers provide round the clock service. MTR Service Update also provides tips and weather advisories throughout the day. Buses in Hong Kong are franchised, and there are currently five franchised bus companies in Hong Kong. Harbour-crossing routes are jointly-operated by two bus franchises. Route numbering is based on the types of route and the districts where they serve. Harbour Crossing and Airport routes, however, use a same numbering system throughout Hong Kong. Routes with a 1xx, 6xx(except Citybus route 629) or 9xx prefixes (eg. 101, 619, 968) are harbour-crossing; routes with A or E prefixes (such as A22, E23) are airport routes. Branded as KMB, Kowloon Motor Bus is one of the largest privately-owned bus companies in the world, and the dominant operator of routes in Kowloon Peninsula and New Territories. It has a second highest market share among all transportation in Hong Kong, behind MTR. Unique design on red-coloured circular-shape routes indication over their bus stops is a symbolic characteristic of KMB. It is common type of transportation if you are moving around Kowloon and New Territories. Long Win Bus is one of the airport bus operators. Unlike Citybus it has an independent franchise on its airport buses service, although it has a heavy correspondence with KMB – its mother company. Routes mainly serve between New Territories and Airports, as well as Tung Chung – the supporting town of the Airport. Company and route details of both Long Win Bus and Kowloon Motor Bus may be found on the same website: KMB.com. Citybus and New World First Bus (NWFB) are the two main bus companies in the Hong Kong Island, and the two are controlled by the same conglomerate. They operate several crucial bus routes, which link some city centre regions of Hong Kong Islands with various destination in Kowloon and the New Territories. Citybus has a relatively denser network on some trunk routes, while NWFB concentrates on local networks on Hong Kong Islands. Company and route details of both Citybus and New World First Bus may be found on the same website: www.nwstbus.com.hk. New Lantao Bus is the primary operator of local bus service within the Lantau Island. Its services are heavily focused on the routes covering the southern region of Lantau because the road network of the area is restricted for access. During holiday vacations and weekend leisure activity they are widely used by either local citizen or tourists for accessing some of the major tourist spots and leisure countryside areas on the island, such as Tai O and Mui Wo. Services also available on weekdays, though trip fares are generally higher at weekends. 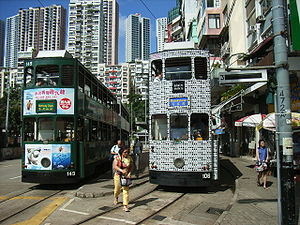 Established in 1904, Hong Kong Tramways is one of the oldest tramway networks in the world remaining in operation today. The majority of its tracks still have the same alignment as at the time when they were built. Along with the Blackpool Tram in Britain, it is the only place in the world with double-decker trams in operation. The tramways not only act as a mode of everyday transportation but also have a tourism value. The main tramway roughly follows the coastline of Hong Kong Island of a century ago. Its route stretches from the western Praya once known as 'Victoria City', whereas both Europeans and Chinese concentrated in the past, traverses the central business district and terminates in Shau Kei Wan to the east. Fares are very cheap, a single journey flat fare is charged regardless of the distance traveled: HK$2.30 for adult, HK$1.20 for children and HK$1 elderly. Although travel by tram is generally slower, the tram is very cheap compared with most cities, and compared with parallel routes which may be reached by using buses or MTR. Ferries can be mainly divided into the following three types of services according to their characteristics. Harbour-Crossing routes are the ferries services, which travel between Hong Kong Island and Kowloon by crossing the Victoria Harbour. One of the services regarded as such is the distinctive and well-known Star Ferry which serves between Tsim Sha Tsui and Central or Wan Chai of Hong Kong Island and is often advertised as one of the 50th must-see sightseeing spots over the globe by the National Geographic, as well as numerous of travelling publications. Hong Kong has a significant number of small outlying islands within its territory and ferry services often become a dominant, if not the only transportation mode for them, as well as for travelling to South Lantau in a more direct routing from the urban areas. Some islands that are especially populated or popular for tourism are well served by frequent ferry services, for example Cheung Chau and Lamma Island as famous local countryside spot and resorts. Most of the services of such type depart from the Central Piers – the transportation hub of domestic ferry services in Hong Kong. Some relatively smaller ferry services run to remote islands, or countryside area which may not accessible by road. These are however operated by local operators and service details and schedule may vary. The service area of taxicabs in Hong Kong is divided by the Government into three parts served by different types of taxi. They are Urban Taxi (red taxi), New Territories Taxi (green taxi) and Lantau Taxi (blue taxi). The scheme is designed to avoid clustering of taxis into the most populated or profitable areas in the territory. Visitors to Hong Kong are most likely to come into contact only with urban taxis, which are licensed to serve all the territory, mostly Kowloon & Hong Kong Island. Pick-up on Terminal 1 &2, Ground Transportation Centre of the Airport, Tung Chung, Disney Resort and New Territories are served by them (passengers on-board returning to Kowloon or HK Island as well as passengers going to the destinations above from Kowloon or HK Island). A tip for crossing the Harbour: try to hire a taxi at a harbour-crossing taxi stand where passenger only pays the one-way tunnel toll, instead of twice of that from ordinary street taxis and 'normal' stands. New Territories Taxi and Lantau Taxi: as their names imply, these taxis serve most of the New Territories and Lantau respectively. Their fares are lower but they are not allowed to serve within designated urban areas, even if the journeys originate within their catchment areas. This page was last edited on 8 August 2013, at 06:19.